Oui, I found this recipe in France. Since I have been home, I have made 4 batches of it. It is easy and flavorful.Translated, it means Hot Nuts. You can taste a bit of heat with each bite…..Chaud! Spread nuts on baking sheet and roast for 10 min, stirring once. In medium bowl, mix together, melted butter, brown sugar, cinnamon, cayenne pepper, and maple syrup. Add the hot nuts to the above mixture. Add the salt and pretzels. Stir till well coated. Spread the mixture back on baking sheet. Return to oven and bake for 15 min stirring once or twice during cooking. 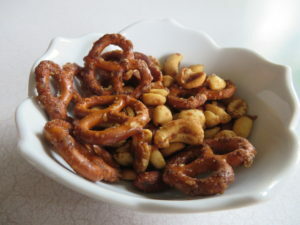 Separating the nuts and pretzels as they cool. This mixture can be stored in a container for one week.